We would have been on time, except for my desperation for a morning coffee. The cafe didn’t open until 9am so I had tried various avenues: firstly I found the mobile number (thanks google) of the contractors I’d given my hobbit hole to in the night who were away with their truck, I assumed seeking breakfast. It was the least they could do to get me a coffee and a bacon roll from wherever they had gone. Unfortunately where they were, which was up the mountain already having started work, there were no coffee or bacon rolls available. Next I prowled about the other campers and hobbit holes looking or anyone who might have a mug and some coffee to lend us, out hobbit hole had a kettle. Fortunately, before I had embarrassed myself too much, someone arrived to open up the cafe. We grabbed a takeaway tea, coffee and bananas (another free meal- this time for having given up our spare hobbit hole in the night) and started down the track but we had lost vital minutes. We alighted only 6 miles down the road at the Hidden Valley car park and headed a few hundred metres up the road to the start of the steep climb up Am Bodach to start the Anoach Eagach ridge. I’d done the ridge a couple of times, the first was 15 years ago with a group of friends from my Uni climbing club when I remember yomping along it with little difficulty. We had husband-to-be in tow who was only convinced to keep going on the promise of one of the party that ‘if things got really bad’, that there was a rope in the rucksac. This rope never materialised and at the end it turned out to be nothing more than a very useful psychological rope. This time I was with Jo, my constant companion on the walk who had also done the ridge with little difficulty more than a decade ago, and Robert, a novice who had always wanted to do the ridge but thought he never would. We felt quietly confident. 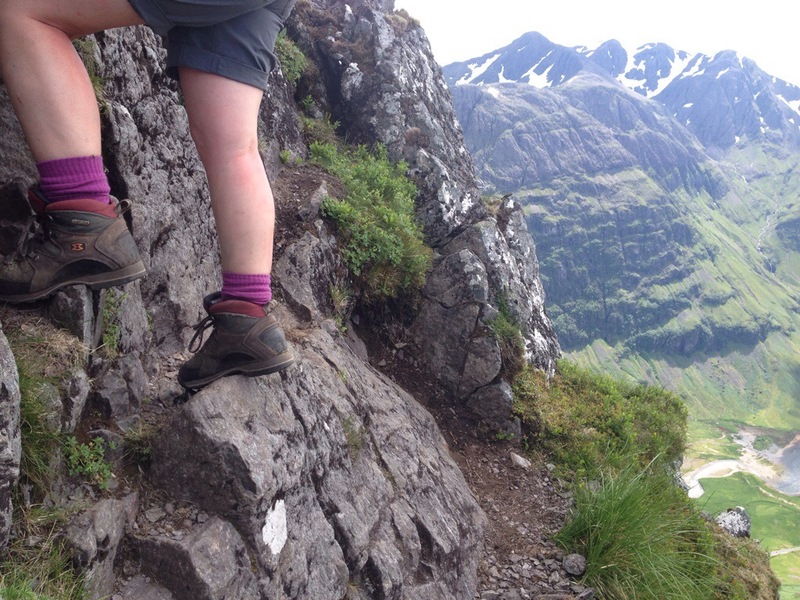 The Anoach Eagach is a 3.5km long ridge and around 2 km of it is scrambling. It is less the technical difficulty that brings the chalenges, but the fearful exposure. The line goes along the top of a row of pinnacles, each perched atop vertiginous cliffs, gullies and chasms. At points the rock in front of you seems almost impossible to negotiate but then solid footholds and jug-sized handholds magically appear to take you over the next section. It really is a magical day out. It was another clear day, cooler and more cloudy as we ascended the ridge and then clearing as we reached the first Munro giving amazing views, taking in Ben Nevis and the Mamores to the North, Rannoh Moor and beyond, the distinctive cone of Shehallion to the east and south, the impressive massif of Bidean nam Bian and the Three Sisters. In the far distance, beyond the sillouette of the Black Mount, we saw Cruach Ardrain, climbed on Day 2 of the walk. It all started fine with the first tricky down-climb and some scrambling under our belts but then we reached the pinnacles and slowed right down. A man in his 70s with wild, white hair limped carefully past us. The trouser of one leg was ripped and bloody, he limped heavily on the other leg. We tried to get him to stop and talk but he hurried painfully on, we offered a bandage from our first-aid kit and some food but he wasn’t willing to wait. Just after that point we made the mistake of leaving the ridge on a bypass path that climbed down and turned into chossy mud and loose rock with a terrifying gulley below. It wasn’t long before I realised that it was the wrong route but, by that time, I had managed to shake my companions up with the exposure of our position and the rest of the ridge became quite a mental challenge. We ascended back to the main ridge, arriving with relief back on route at a patch of horizontal ground big enough to accommodate all three of us. When we had persuaded Robert to let go of the clod of earth he was holding onto for dear life ‘This tussock is my friend’, we continued the airy scrambling. 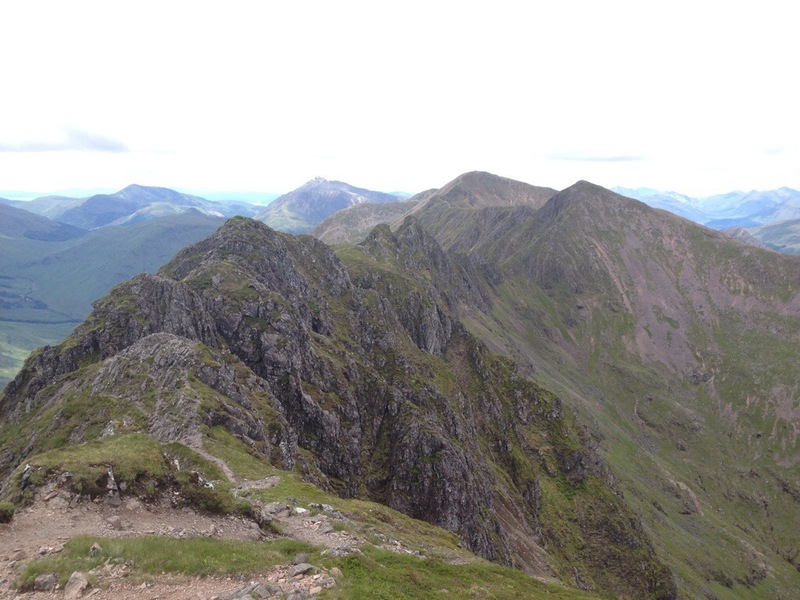 Once we had passed the pinnacles and ascended to Stob Corie Leith, it was a simple ridge walk to the second Munro and then down via the bealach between the ridge and the Pap of Glencoe with superb views down Loch Leven and Morven beyond. 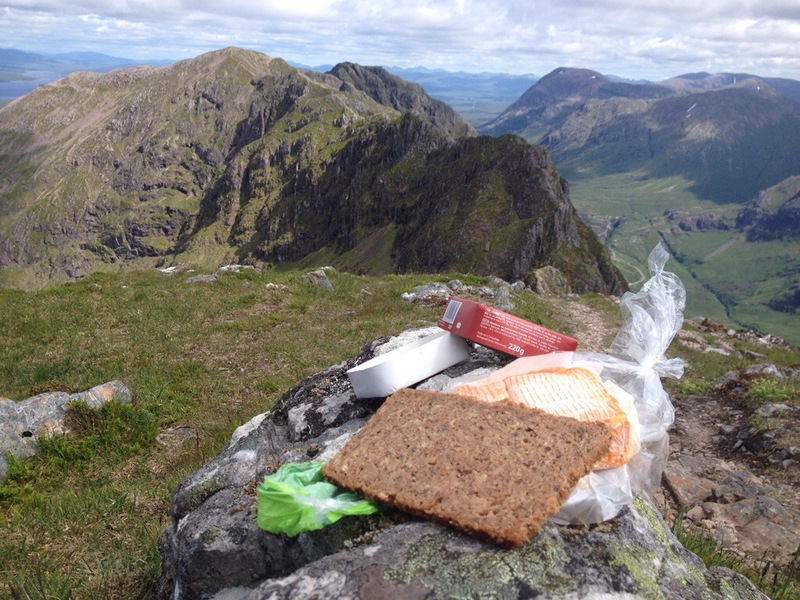 As I toasted the successful traverse with some more of my stinking cheese (no-one else would partake) a helicopter flew low over Bidean, hovering for a moment over the summit of Stob Coire nan Lochan. It then came over towards us and flew along the ridge hovering over the first Munro where we presumed that the man with the injured leg had reached. It didn’t stay long and soon it was off, direction Fort William. Postscript: Later, while we were relaxing at the Youth Hostel, the man we’d seen on the ridge hopped in, leg in plaster and on crutches. He had met a group who were more insistent than us at making him stop, who had seen his injuries and called in the mountain rescue. At the Belford hospital in Fort William they has set his ankle, broken in two places, and patched his gashed leg. He could barely make it from reception to a seat in the common room. I asked myself how he had managed to hurry so determinedly past us on the ridge, having already negotiated some of its more challenging sections.